Dominique Davis threw for 187 yards with a passing touchdown and a rushing touchdown to lead the Ottawa REDBLACKS to a 32-17 win over the Toronto Argonauts in both teams’ final pre-season test on Thursday night in Guelph, Ont. Davis, competing for the team’s No.2 quarterback role, guided an efficient and consistent REDBLACKS offence to an early lead and the visitors never looked back. Kieren Duncan returned the opening kickoff for 57 yards, which put the REDBLACKS in position to take an early 3-0 lead on a 45-yard field goal by Sergio Castillo. Not to be outdone, Mario Alford matched Duncan’s return on the ensuing kickoff for the Argos. Starting from the REDBLACKS’ 38-yard line, James Franklin led the Argos on a seven-play drive culminating with a four-yard touchdown grab by Jonathan Epps to make it 6-3 for Toronto. The visitors didn’t wait long to respond during an eventful first quarter at the University of Guelph’s Alumni Stadium west of Toronto. Davis and running back Cedric O’Neal led a 60-yard touchdown drive on their next possession, capped off by a two-yard run by O’Neal put Ottawa back in front 9-7. Following an Argos punt, the REDBLACKS’ offence continued to roll smoothly down the field until Jonathan Dowling intercepted Davis just outside the red zone and returned the ball 43 yards. Toronto advanced the ball to the REDBLACKS’ 10-yard line, but were forced to settle for a field goal to retake the lead. Once again though, Davis and O’Neal were able to drive the ball upfield with a balanced rushing and passing attack that led to a one-yard sneak into the end zone by Davis to give the REDBLACKS a 15-10 lead. Both teams turned the ball over with fumbles during the second quarter, but it was the REDBLACKS offence who once again got back on track late in the half. O’Neal continued to pound through the Argos defence, totalling 86 first-half yards, to set up another touchdown. For the score, Davis tossed a 19-yard pass to Seth Coate, allowing the receiver to make up for his prior fumble, to put Ottawa up 22-10 at halftime. Davis finished the night 18/23, demonstrating his ability to lead the offence if need be during the regular season. Franklin’s night also ended at halftime, where he completed 9/14 throws for 72 yards and a touchdown. Mcleod Bethel-Thompson entered the game as the Argos’ pivot in the second half and completed his first three passes before Reggie Daniels disrupted his rhythm with a diving interception for the REDBLACKS. The Argos defence responded with a forced fumble by Sean Harrington, but their offence continued to struggle. Danny Collins lead the REDBLACKS to another field goal late in the third quarter to extend their lead to 25-10. 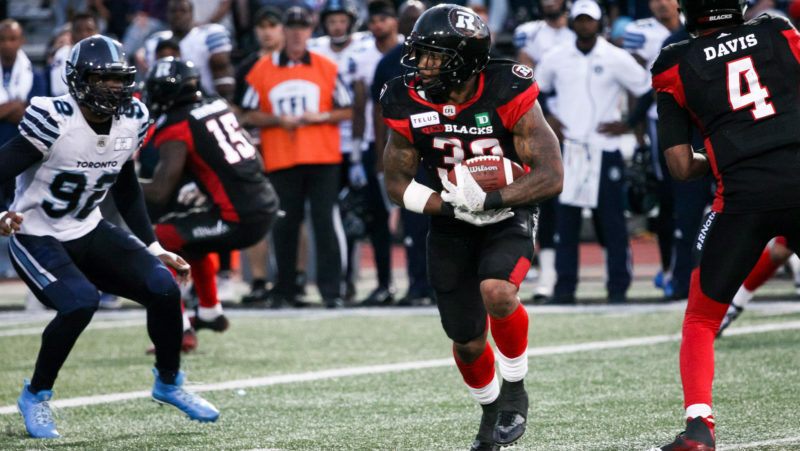 The biggest play of the third quarter came when REDBLACKS rookie Aarion Penton picked off Bethel-Thompson and returned the ball 54 yards to the house to pad Ottawa’s lead. The Argos forced their way back into the game on the first play of the fourth quarter, when Bethel-Thompson capitalized on a breakdown in REDBLACKS coverage and found Alex Charette for a 63-yard touchdown which narrowed the deficit to 32-17. The highlight of Collins’ second-half outing was a 33-yard connection with Chance Allen in the fourth quarter, as the REDBLACKS coasted through the second-half without much more resistance from the Argos. Next up for the Argos is a trip to Regina to open the season against the Roughriders on June 15 at 9 p.m. EST. The REDBLACKS will open the season in Week 2 at home against Saskatchewan on June 21 at 7:30 p.m. EST.